Amazing how this category keeps going from strength to strength. Themes of this year are fantastic palate concentration and richness and yet another leap in quality - it remains an exciting category. Elgin conspicuous by their absence, while Ormande should have made the final cut. Top 10 to be announced on 27 September. 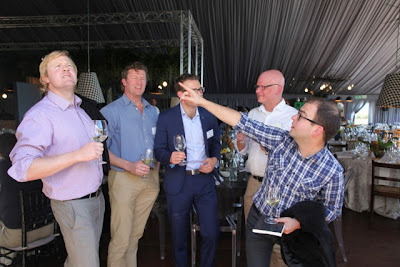 An unprecedented 91% increase in price per litre paid at the 2013 Nederburg Auction, held at Nederburg in Paarl at the week-end, is excellent news for South African producers, and an affirmation that the event’s increased focus on quality is paying off. Organisers of South Africa’s premier fine wine auction say the increase comes on top of a further overall income result of R4,38 million – more than double the amount expected due to reduced volumes on auction. Steyn further added that the tighter selection this year resulted in a much stronger line-up. Since this was a completely blind tasting, quality, and only quality, determined inclusion in the auction line-up. “If a wine made it to the auction, it was worthy of the auction seal of approval. However, not all of the smaller producers attained the prices they deserved, that could be attributed to a lack of self-promotion.” Francois Rautenbach, buyer for the Singita Game Reserve, commented that the solution is twofold: “Be visible, and prepare by putting aside something special that offers a genuine sense of exclusivity.” Keynote speaker Joe Roberts reinforced this statement in his keynote address, where he highlighted the fact that producers need to tell and sell a story. Regarding wine categories, the average price per litre achieved this year was R354.64, compared to R184.78 in 2012. Highlights included the highest price of R22 000, paid by Next International of Nigeria for three 750ml bottles of Zonnebloem Cabernet 1973. Other standout prices achieved included R17 000 paid for a single case of 6 x 750ml bottles of the Monis Collectors Port (Double Stamp Collection) 1948, R8 500 paid for one case (6 x 750ml) of the Kanonkop Cabernet Sauvignon 1997, and R7 000 paid for one case (6 x 750ml) of the De Krans Vintage Reserve Port 1993. Distell MD Jan Scannell said that he was very pleased to see a 4.7% increase in wine sales to Africa, accounting for 28.7% (R1 249 200) of the total auction turnover. In terms of international sales, which contributed 8.3% (R360 600) of total sales, the biggest contribution came from the United Arab Emirates, accounting for R219 150. A complete price per litre summary, including comparisons by category, will be published on the Nederburg Auction website, shortly.